Is it just me, or is anyone else still reeling from the events that occurred during the Academy Awards last night? It’s still kind of fascinating to me that we can see culture reflected so much in the gathering of a very narrow sampling of the population — the celebrities who make it to the Oscars, that is — but we saw examples, both positive and negative, of a churning society several times last night. Even before the Oscars began, the hashtag #AskHerMore was floating around the Internet with great zest; and during the ceremony, the complexity of the human race was even further revealed: Sean Penn’s arguably racist comment about Alejandro Iñarritu’s green card, Iñarritu’s demand for respect for the citizens of Mexico, John Legend’s comment that a civil rights issue that happened over 50 years ago still relates to today’s society, speeches promoting awareness of ALS and Alzheimer’s… the list goes on and on. 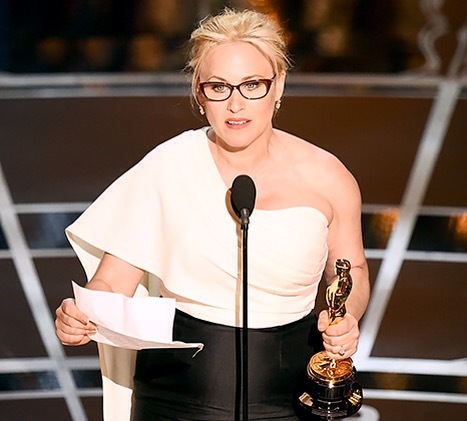 And that list includes Patricia Arquette’s speech about women’s rights and equal pay. Hold on, Patricia Arquette. Are you insinuating that people of the LGBT community have won their battle? That the civil rights issue is in the past? That people of differing sexual orientation and color, including women, need to stop everything and focus on women’s rights? No. She wasn’t insinuating that at all. And yet, many feminists attacked the actress for her comments, dismissing her as just another white, privileged woman. Never mind the fact that this follow up was a spur-of-the-moment thing, because, you know, no one has a problem with spontaneous articulation. You know what bothers me the most about the fact that people are attacking her for her words? That in focusing on her poor phrasing, they are pushing the heart of her message away from the forefront. Instead of embracing a woman who is fighting for equality, people are scoffing, and dismissing her. Which — correct me if I’m wrong — is the very kind of thing that discourages equality. Now, I’m not saying that we should just nod our heads and smile when someone slips up and says something disrespectful or unintentionally hurtful… I’m just saying we don’t need to attack them. Perhaps instead we could sit them down and explain why we think they should reevaluate their words. Those who are so violently opposed to the idea of feminism most likely take that stance because the only type of resistance they’ve received is hateful, militant resistance. And this doesn’t just relate to feminism, but for pretty much any issue… when a person’s words conjure up such hostility, the natural instinct is to roll their eyes and label the attacker as temperamental and oversensitive and, therefore, not worth listening to. Not exactly the best ground to lay for healthy conversation. Since this incident is in light of the Oscars, I found a soothing parallel of truth in the words of director Alejando Iñarritu as he and his fellow filmmakers accepted the award for Best Picture. “Ego loves competition,” he said. “For someone to win, someone has to lose. But the paradox is that true art, true expression… can’t be compared, can’t be labelled, can’t be defeated, because they exist.” This statement, though a bit truncated for the sake of my argument, already captures something beautiful… but replace the words “true art” with “people”, and you have a statement to live by.